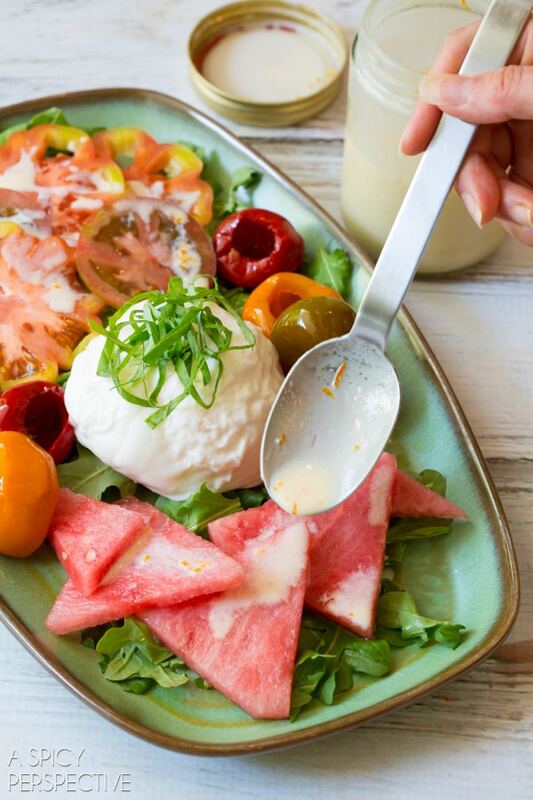 This cool and refreshing summer salad with a touch of creamy decadence from California Burrata cheese and sparkling yogurt dressing, is a must-have this summer. The moment the weather turns warm, I start craving salads with passionate fury. Just to clarify, we eat salad everyday for the sake of getting our raw veggie quota, but I only crave salads in the late spring and summer. Fresh summer produce from the farmers market (or better yet, the garden) is highly prized at my house. I plant a few hearty seedlings every year, then say a prayer, cross my fingers, and hold my breath, hoping for a bumper crop of heirloom tomatoes, squash, peppers, and even melons. Last year I was out of luck with the seemingly endless rain here in western North Carolina. But this year… I’ve got a good feeling. 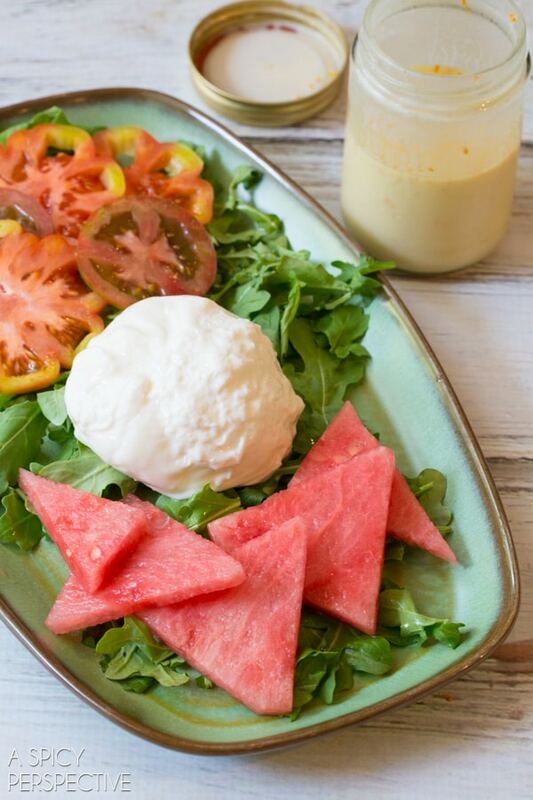 I’ve already started celebrating this season’s bounty by combining my two favorite summer produce treats, watermelon and heirloom tomatoes, with luxuriously creamy burrata cheese and silky yogurt dressing. 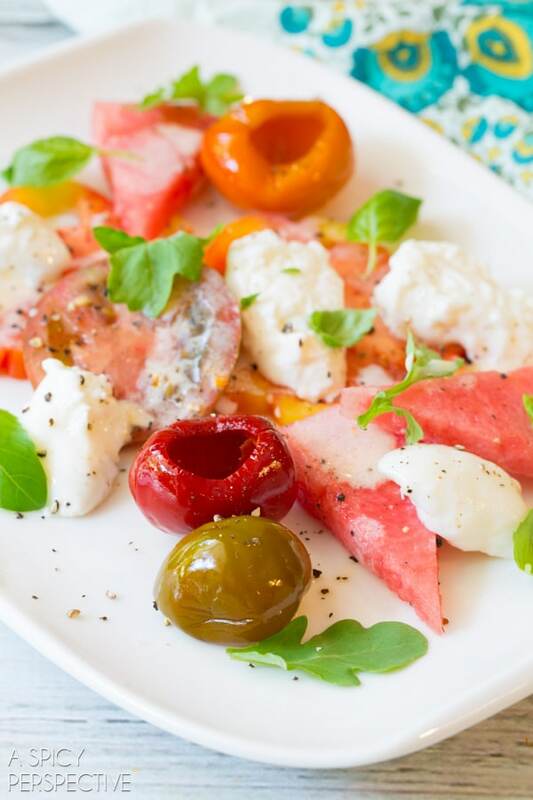 I adore pairing fresh California cheeses and dairy products with summer fruits and veggies. Because they are so thoughtfully made, California dairy products offer a clean creamy taste and texture that isn’t bogged down by unnecessary ingredients. California dairy products are sold all over the country. When you buy products with the Real California Milk and Cheese Seals you know that your dairy products are made from 100% California milk, from one of California’s 1,500+ family-owned dairies. 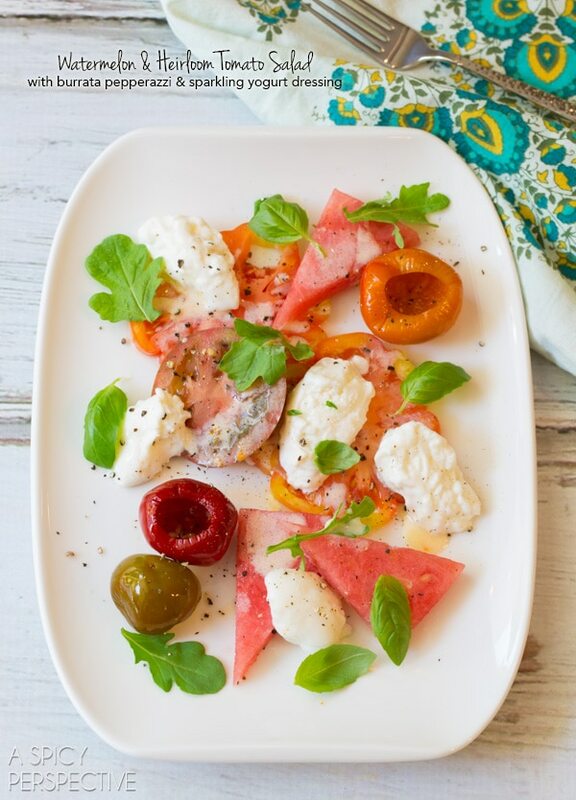 In this particular watermelon salad the soft decadent California Burrata Cheese brings a perfect balance to the sweet watermelon and tomatoes, that is then offset by a creamy *sparkling* yogurt dressing blended with mandarin orange and champagne vinegar. 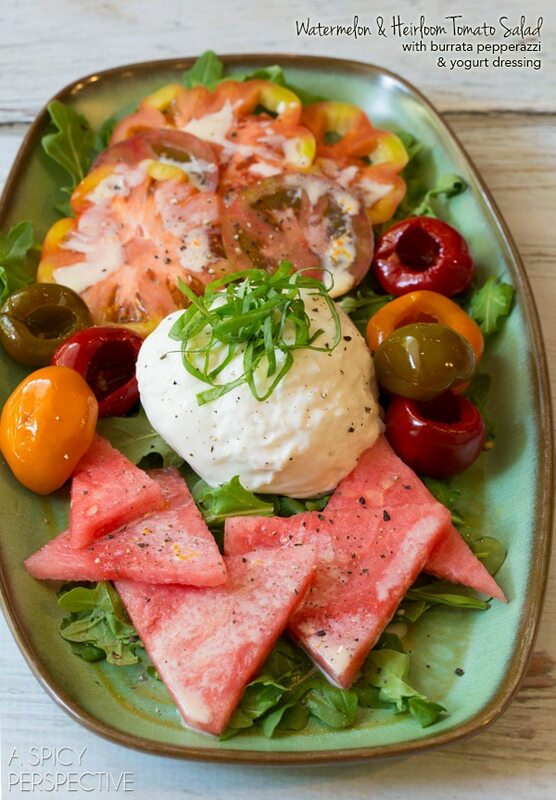 The pepperazzi peppers provide a salty tangy pop of flavor to round out this amazing plate of summer goodness. 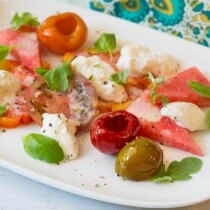 As you can see in the photos, I make this watermelon salad two different ways. If sharing casually with friends, make one big share platter and scoop into the soft California Burrata with a serving spoon. Or you can plate small individual servings for a dinner party, that have a modern and opulent appearance, with little dollops of California Burrata and yogurt dressing drizzled about. See? This is a salad you will make again and again. With fresh summer produce and creamy California dairy, you cannot go wrong! A time to celebrate all dairy foods and recognize the more than 1,500 California dairy families who produce California milk. In California, June is “Real California Milk Month” as proclaimed by Governor Jerry Brown in appreciation of all the dairy families who make California the number one milk-producing state. Dairy just so happens to be California’s number one agricultural commodity! 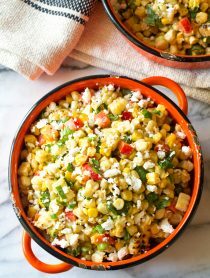 Celebrate National Dairy Month with us by checking out more fabulous dairy-laden summer recipes on our Pinterest Board. And don’t miss today’s giveaway generously donated by the California Milk Advisory Board! Follow the prompts in the automated entry form below. For US residents only. My favorite way is to freeze it – into ice cream! Creamy popsicles made with dairy products. Orangesicle is our favorite. My favorite way to serve dairy in the summer is in homemade ice cream. Making home made ice cream in the summer is always a fun thing to do. I love having burrata, ricotta, or some other creamy and flavorful cheese on top of salads- especially roasted stone fruit and arugula. Add in some marcona almonds and rosemary and it’s soooo good! Could eat it all summer long! I love making ice cream in the summertime! I love cheese! Cheese with watermelon in the summer is great! The Dairy Association should start a ‘Got Cheese?’ Campaign. It’s summer, I live in Florida, and I’m hot flashing….ICE CREAM!!! Cheese plates for outside dining..
fruit and cheese trays are my favorite! Thanks for the awesome recipe! Dairy in the summertime sounds like the perfect excuse for ice cream to me. I love to put yogurt in smoothies during the summer months. I love to serve homemade ice cream in the summer the most. Yummm! I just started eating watermelon with mint and it’s my new favorite summer snack. Looking forward to trying out this recipe next! Fresh yogurt with fresh fruit cut up into it is my favorite. EXTRA CHEESE on everything we grill! Making homemade ice cream treats with the children. My favorite way is in homemade ice cream. I usually serve it with fresh berries. I also like to make homemade Ranch dressing. Ice cream or frozen yogurt pops w/ cut up fruit in them are my favorite. Pizza & Ice Cream, why not? I want to say ice cream.. I love it but cant eat a lot of it… makes my tummy hurt. So I will say I use I use dairy in the summer in the way i always use it.. cheese! In salads or on a sandwich or whatever. In the winter its definitely milk and cookies, in the summer it’s homemade ice cream and fruit from my garden. Nothing better than homemade ice cream! Ice cream HAS to be the winner here! Homemade ice cream is the best! My favorite is homemade ice cream, especially my bittersweet chocolate ice cream. My favorite way to serve dairy in the summertime is by making homemade ice cream! Yogurt parfaits and Ice cream. What a fun summer salad! In a cone, of course! Topping pizza made on the grill. I love grilled cheesy pizza! My favorite way is ice cream. I love homemade ice cream or custard! I love to make homemade pudding in the summer! Homemade ice cream of course! I know it’s really cliche.. But it doesn’t get better than homemade ice cream! I’m happy with a nice tall glass of cold milk. Also, during the summer, I don’t like to cook too much; so, it’s nice having a cheese and ham sandwich or crackers with cheese and olives along with a bowl of salad. I love having yogurt for breakfast with fruit. That salad is art. Beautiful! Salads like this with mozzarella or feta! What a refreshing salad. I like the arrangement on the plate. Very attractive. Homemade ice cream for sure! I love to make homemade icecream! I love burrata, what a perfect summer salad! My favorite way to serve dairy is homemade ice cream! 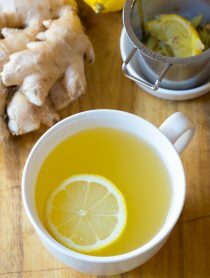 This really looks so refreshing! I have just started making a caprese quinoa salad for cookouts that’s been healthy and delicious. Love using mozzarella in it! Love how fresh this salad is, Sommer! This looks great! I also love Burrata and Caprese salads in the summer! I love to put yogurt in my smoothies. Hmmm . . ice cream and panna cotta! Greek Yogurt with honey and walnuts! I love to make key line milkshakes! I love making a cheese plate on Saturday afternoons. 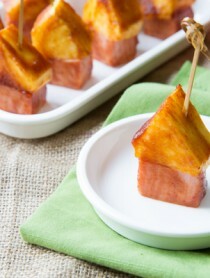 Great way to snack on the weekend between meals! An ice cold glass of milk, cheese and crackers followed with ice cream. Perfect for when it is too hot to eat much. This salad is totally beautiful Sommer! Hmmmm- well ice cream would be my top dairy choice in the summer. But there are so many other recipes I love too. I can’t get enough watermelon! Love this salad! In a smoothie or milkshake. Anything with burrata is a winner! Love how fresh this salad looks, Sommer! What a nice summer fresh salad! I love to make tasty drinks with dairy, including smoothies and milkshakes. However, I do have an ice cream maker that I have yet to use *gears in brain turning*! Thanks for the chance to win. Caprese Salad is one of my favorite summertime treats! Garden fresh tomatoes and basil with creamy mozzarella is amazing! My favorite way is homemade vanilla icecream with fresh stewed berries like blackberries. Such a gorgeous summer salad. Looks awesome Sommer! When it comes to summertime and dairy, I think of homemade ice cream with fresh strawberries or peaches. 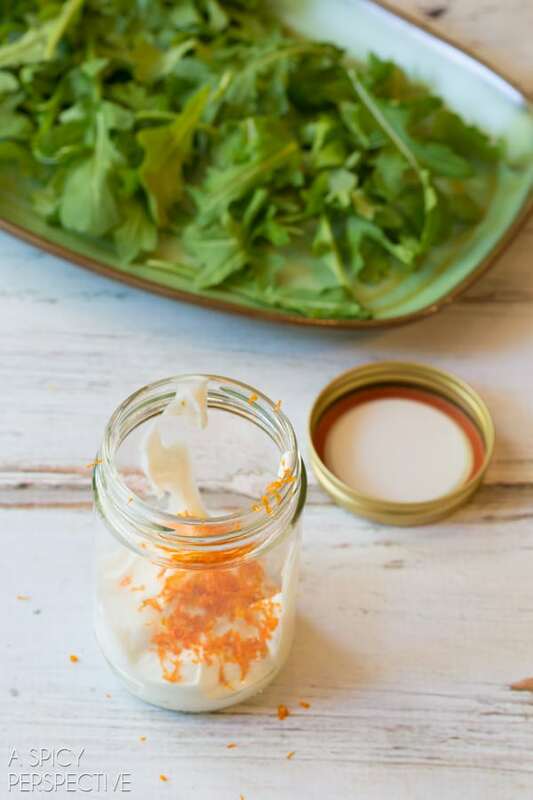 I love how summery this salad is – burrata is such a treat!